I wanted to share a few pics from a project I did with my friend in her new house. Erika’s family room has a wall that was built out to cover an old fireplace (by the previous owner). 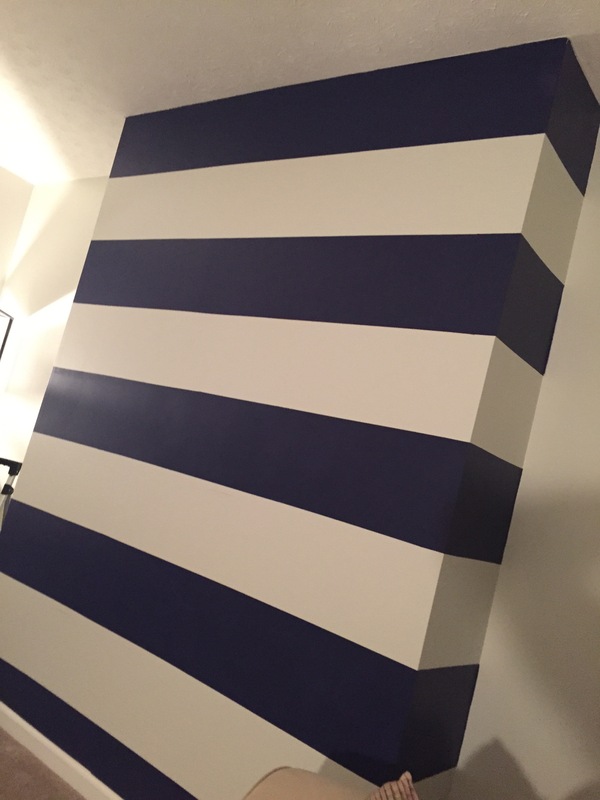 At first she talked about putting built ins on either side, but later she came to me with an even better and more affordable idea: paint stripes on the protruding wall. Whoa. Why hadn’t I thought of that!?! I freaking love stripes! 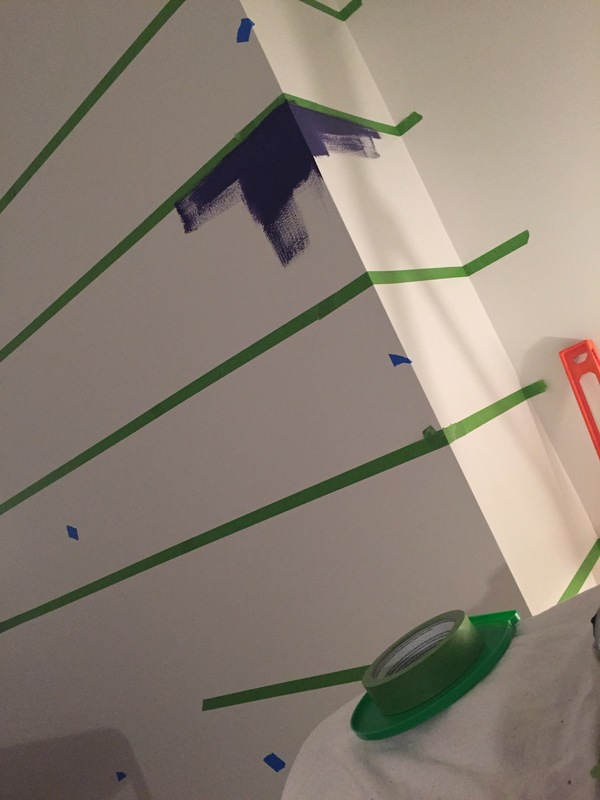 So we got to it one evening after work with a level, Frog Tape, and a great paint color. She chose Behr Vintage Velvet. It has a rich navy vibe with a hint of indigo. When we put the first coat on it was quite purple looking. Admittedly, I got nervous but the second coat had me sold. Between coats Erika painted her sofa table (serving as TV stand for now) navy to blend in a bit more. Above: Erika putting the room back together. But you can see all the elements of the room. I really thing the navy pulls it all together. Below: A panorama of the room. On the far left you can see that she decided to paint the inside of the door with the same Vintage Velvet. I’m a huge fan of bringing the front door color to the inside of the house… as I’ve done it with mine a few times. Below: You can see that the striped wall stands out and created a dark pace in the back corner of the room. On a whim we opted to try a full length closet mirror that she had upstairs to reflect lamp light and give the corner something it was missing. The mirror serves purpose as a light source but doesn’t take away from the room or create a busy corner. We’ve all hung wall art where it doesn’t belong. Sometimes less really is more. Below: The opposite corner of the room has more natural light with the window and Erika added a cool open shelf to match her coffee table (IKEA VITTSJO). When we were all finished with paint we took a few minutes to grid out a cluster of some small square mirrors (IKEA MALMA) over the couch. That wall of mirrors costs less than $25 but makes a great impact. In the end Erika made a bold choice by making an awkward wall into the statement piece of the room. Now it feels like a key architectural element and really brings the whole room together. I’m so in love with he ruse of mirrors that I got some for my own house!